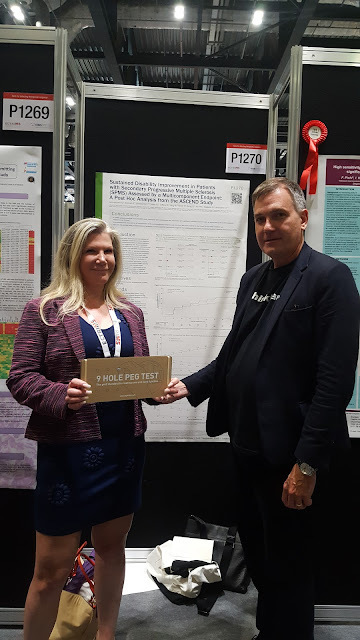 Deb Steiner and Prof G at the poster at ECTRIMS! According to your post Natalizumab helps those in SPMS to preserve the hand function, but NICE will judge against its use on the grounds of cost-effeciveness. Will neuros in Barts start prescribing Natalizumab on patients with SPMS as off-label? Can these people get it prescribed on other hospitals if they pester their neuros? When will the patent of natalizumab expire? Are those with RRMS on Tysabri more likely to protect their arms/hands compared to those on other DMTs (and especially alemtuzumab)? Will Barts prescribe….unlikely as NHS England will not re-emburse just like they have refused requests to use rituximab off-label. Will hand function be protected with other DMT…yes but fingolimod seems to be an odd-one out…why? You see, if you get info from ProfG and you get the glass half full approach:-). I was on Tysabri for 3 years but came off it owing to being JC Virus positive. I'm in a wheelchair but had episodes of walking while on Tysabri. While on Tysabri I also had chronic upset stomachs so was offered Lemtrada. On stopping Tysabri I had an awful relapse which affected my hands which have continued to get progressively worse despite Lemtrada. Should/could I ask to go back on Tysabri or ….? Is there data on Ocrelizumab and PML? So far, there has been no case of PML with Ocrelizumab (PERA I, OPERA II, ORATORIO study). So far, there has been no case of PML wirth Ocrelizumab (OPERA I, OPERA II, ORATORIO study). And that's why I don't feel I can trust this 100%. Unfortunately there is nothing I can do about my conflicts! Let's hope we can repeat this study's finding with off-label cladribine. Would you trust the results then? Are you wearing a Think Hand t-shirt? Yes, I am wearing a #ThinkHand T-shirt. I have a lot of spares so if you drop me an email with your size (S/M/L/XL) and address I will send you one in the post. First come, first served. Does it have anything to do with OCB disappearance seen on natalizumab ? Re: "Does it have anything to do with OCB disappearance seen on natalizumab ?" Not sure if the small case series of disappointing OCBs are a real finding or not. A larger German study did not confirm the earlier results. But I doubt it has anything to do with disappearing OCBs. The treatment effect is to quick. I am sure it due to anti-inflammatory effects of natalizumab. Would you expect to see the same "sustained imptovement" in upper limb function if it were PPMS patients? Assuming they had similar (or even better) EDSS scores. Trying to understand if this is relevant only to individuals who went RRMS -> SPMS or if it is significant to those with PPMS. Anon 2:25 – that is a very good question I think. A fundamental and crucial question. Glass half empty point of view. How many MS patients that are JCV + could even stay on Tysabri safely without risk of PML for over 2 years of treatment, let alone the 4-5 years that Dr. G would like to see? With Tysabri how many patients will be alive to exhibit this "therapeutic lag" hypothesis. Is there other medications that MS patients could use other than Tysabri, i.e. alemtuzumab, BG12, cladribine, ocrezulimab ??? What about HSCT with ablative vs. non-ablative therapy? I have askd exactly the same question below but noone has answered it. People are talking excitedly about protection of existing functionality for those with SPMS, such as me. Is there nothing available for me and thousands of others in the same boat? Re; "Is there other medications that MS patients could use other than Tysabri, i.e. alemtuzumab, BG12, cladribine, ocrezulimab?" What this study shows is that with a high-efficacy therapy such as natalizumab you can modify the course of SPMS. What we need to do is change a trial design to maximise the chances of getting a success with future trials. That is to focus on disability improvement and upper limb function. At present I can't recommend other drugs because we don't know if they will work in this situation which is why we need trials. We are in the process of designing a trial with off-label cladribine as a starter. But we are also lobbying industry to do the same; I see no reason why alemtuzumab, ocrelizumab, oral cladribine or daclizumab can't be tested using this paradigm. However, before Pharmacist does a large phase 3 trial they will need to be convinced the regulators (EMA & FDA) and the payers will accept a trial with these outcome and whether or onto they will need to do one or two trials. So at present we can't recommend any of these treatments as they are too expensive to prescribe off-label; the NHS and insurance companies will say no. We also want to manage expectations and these therapies are not going to reverse much disability to normal. In all likelihood their effect will modest and slow down progression. Biogen states that the ASCeND trial is negative yet the 9 hpt was positive and the study was not designed properly……"up is down and down is up". Are you going to discuss the presentation on HSCT from Silesian Medical University, Katowice, Poland? It would be interesting to get your views on the scientific robustness of this paper and its findings and how it moves forward the discussions / or not of HSCT as a viable treatment / cure. I am JC positive and was on the ASCEND trial. I do not know if I was on a placebo or not. It would be stupid for me to consider Tysabri even if it was available. I have noticed that ,y hands ar becoming clumsier, writing is very difficult and doing up shirt button is tricky. This has all developed in the last couple of years. Is therre another drug/treatmemt that would slow down or even stop the inevitable? If I'm honest, I'm almost disturbed by this, because I see DMTs as very possibly being worse than the disease in my case – having slow moving progression. I am less excited by Ocrelizumab: Nasty long term side effects, wrecking ball approach, not working in everyone with PPMS even if you look at results in terms of hand function? Will the community get behind natalizumab treatment in SPMS? I suspect not, we are a lost and forgotten cause. Re: "Will the community get behind natalizumab treatment in SPMS?" Maybe; we would need to work on the community. Not many people I know buy into the length-dependent axonopathy and therapeutic lag hypotheses. In addition, there was a disconnect between MSers and Neurologists on whether or not treatments work in SPMS. Re: "…we are a lost and forgotten cause." I may be glass-half-full kind of person, but the whole #ThinkHand campaign is to address a massive unmet need and to get effect treatments into the clinic for both SPMSers and PPMSers. I know you are inpatient, but things are happening.